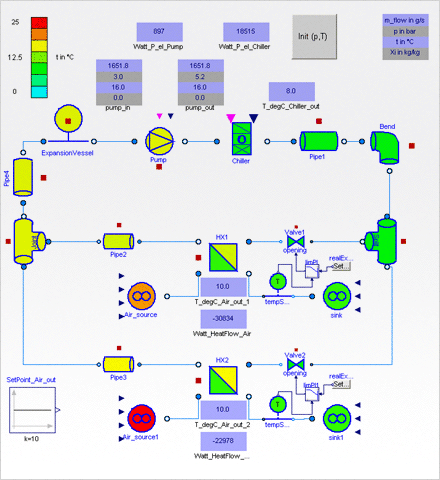 HG "Sep 11 2014", "18:31:35"
The Hydronics Library allows detailed modeling of thermo-hydraulic systems including heat exchangers for humid air and liquids. All components like pipes, bends, pumps and valves can be insulated, non-insulated or adiabatic. Joints, orifices, sudden expansions, contractions and expansion vessels complete the range of model components. The example in the figure below shows the cooling of two different air flows in two heat exchangers. Control valves distribute the coolant mass flow. Model diagrams get animated according to fluid temperature and visualizers for model outputs like pressure, heat flow and electric power can be added. This library is used in automotive, aircraft and shipbuilding industries for cooling and heating applications. In modern heat distribution networks or similar applications, the ratio of mechanical effort and thermal performance of heat exchangers is also very important. By design, this library is limited to incompressible media. In return, systems with more than 100 sub-components are supported with robust initialization. User specific media data can be easily added in a table-based way. Another benifit is the support of both dynamic and steady-state simulations. Dynamic simulations allow the optimization of pump and valve controls, while steady-state simulations allow rapid calculation of pressure loss or performance in arbitrary operating points. The library uses XRG's free FluidDissipation Library for pressure loss and heat transfer calculation. The air side of heat exchangers can be easily combined with Libraries using stream connectors like AirConditioning, HumanComfort or Modelica.Fluid. Hydronics Library 2.0.2 is available for Dymola.